Pres. 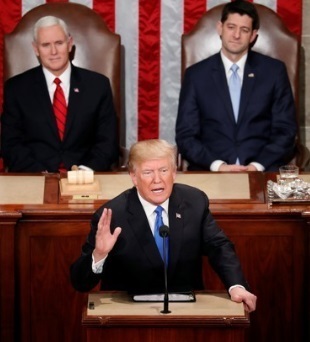 Trump's first State of the Union address, plus Rep. Joe Kennedy's response. Joe Kennedy III: Don't measure worth by the gender of your spouse. Donald Trump: Business tax rate slashed from 35% to 21%. Donald Trump: Tougher on drug dealers to end scourge of opioids. Donald Trump: Workforce development, job training, & vocational schools. Donald Trump: End the war on beautiful clean coal. Donald Trump: Sanctions on Communist dictators in North Korea & Cuba. Donald Trump: Foreign aid only to friends of America. Donald Trump: FactCheck: Yes, Senate approved US Embassy in Jerusalem. Donald Trump: The era of economic surrender is over: reciprocal fair trade. Donald Trump: FactCheck: Removed more regulations than other presidents. Donald Trump: Let terminally ill take any experimental drugs. Donald Trump: The cruel ObamaCare individual mandate is gone. David Shulkin: Largest modernization effort at VA in decades. Donald Trump: Fire 1,500 VA employees who failed to serve veterans. Donald Trump: Unmatched power is key to defense, including more nukes. Donald Trump: Keep Guantanamo open; stop releases & add new prisoners. Donald Trump: Close deadly loopholes that allow in gangs like MS-13. Donald Trump: Americans are DREAMers too; pass a bipartisan compromise. Donald Trump: Four pillars to a fair compromise, including 1.8M DREAMers. Donald Trump: Replace visa lottery with merit-based system. Geoff Diehl: Build the wall; stop chain migration; end sanctuary cities. Joe Kennedy III: Build a wall and my generation will tear it down. Joe Kennedy III: To all the DREAMers: Vamos a luchar por ustedes. Donald Trump: 200,000 new manufacturing jobs with lowest unemployment ever. Donald Trump: Get Motor City revving its engines again. Donald Trump: Fact-check: African-American unemployment lowest in history. Donald Trump: Judges should just interpret law, like religious liberty. Steve Scalise: Back to work in Congress 3 months after getting shot. Donald Trump: Doubled standard deduction for all; average $2000 tax cut. Geoff Diehl: 80% of Mass. residents will get tax cut from Trump's plan. Donald Trump: $1.5T for new investment to fix infrastructure deficit. Donald Trump: Change permitting rules to build reliable infrastructure. Joe Kennedy III: The world's greatest nation shouldn't leave anyone behind. The above quotations are from 2018 State of the Union address to Congress, plus the Republican Democratic Feb. 28, 2018.